Home / TEACHERS COURSES / EDUCATIONAL MEDIA AND TECHNOLOGY: MODULE 3. EDUCATIONAL MEDIA AND TECHNOLOGY: MODULE 3. • Support the sensory organs to maximize effective communication. E.g. • Use of an amplifier and a microphone supports effective hearing. • Enlarged images of small objects help the learner to see details otherwise impossible to be seen with naked eyes. • Stimulate and sustain interest in learning. • Provide first-hand experience with the realities of the physical and social environment. • Encourage active participation by learners. • Save time (ie: explaining concepts etc). • Make abstract ideas more concrete. • Develop the power of imagination, observation, reasoning and creativity. • The content of a topic can be carefully selected and organized. • Delivery of instruction becomes systematic and standardized. • Change chalk and talk instruction to interactive instruction. • It is an oral communication, a medium in which valuable information (skills, knowledge, values and experiences) are passed from one person/authority to others. • It is in the form of songs, proverbs, sayings, face-to-face story telling. • Currently with modern media, it can be taped, stored, retrieved and reach many people via teleconferencing, radio and TV. Discuss the advantages and disadvantages of using speech as a medium in teaching and learning process. • Three dimensional materials: realia, models and specimens. • Printed materials: textbooks, workbooks, newspaper, journals, handouts etc. • Graphics: charts, graphs, maps, posters, etc. • Teachers use them in T/L situation to bring in reality of what he/she presents. • Examples: cheques, Bank statements on financial management lesson, a tree, house, a hoe, cooking utensils, soil, live animals and plants, equipment and apparatus for Science, musical instruments, shells etc. • Learners can easily relate them. • They provide a clear and true experience. • They capture the learners’ interests, thus making learning more effective. • They are readily available and their use encourages the teacher to refer to the immediate environment. • Their use motivates and stimulates learners. • They enhance development of manipulative skills. • Bringing things to class may be difficult especially if they are very big or dangerous. • Living things may amplify the learners’ excitement and cause disruption of their learning in the same lesson or another lesson. • Collecting some types of realia may have a negative effect on the environment. Refer to objects which are representative of a group or a class of similar objects. Can be a whole thing E.g. flower, leaf, fish, frog, and insect OR a part of an object (e.g. : wing of a butterfly, the head of a grasshopper, the bark of a tree etc.) Specimens are usually preserved. • They can be used for a long time of properly handled and stored. • With time, depending on the method of preservation, some parts or characteristics that the specimen represents, such as colour, may be distorted. • As they are to be handled with great care learners may not be able to manipulate them as they study them. • Some of the liquid preservatives have an offensive smell which may make the learning environment uncomfortable. A model is a three dimensional recognizable representation of a real thing. It may be reduced or enlarged reproduction but it is made into size convenient for detailed study. Models are used if the real thing is not available, too large to take to the class, or too small for the naked eye to see, or too dangerous for the students to manipulate. E.g. the skeletal system of man, the human eye and motors of machines. • When learners are involved in making the models, they internalize the concepts. • Models can be assembled or dissembled when the need arises. • Concepts and special features can be easily explained. • Being the 3-dimentional, models give the feeling of substance and depth of the real object. • Models can be manipulated by learners. • Since models are not always made to size, they may give the wrong impression of the real thing. • It is difficult to involve learners in making models of things they have never seen. • They may be oversimplified which may cause misinterpretation of the real situation. Three dimensional objects are very useful in T/L situation. Basing on this fact; explore six precautions a teacher should consider for using them effectively. • Enabled spread of knowledge, skills, information, events, attitudes and experiences via notes, books, journals, varieties of documents to a much wider public. • Printed materials are publications. They Include: Textbooks, worksheets, teachers notes, maps, photographs, posters, newspaper, journals, handouts etc. • Print will continue to dominate in the teaching and learning situations (Careen, 1984). Briefly discuss the above two statements via your groups. • Present words, numbers, musical notation, diagrams and signs. • Have made teacher’s notes, books etc available to students at their home, schools or a wider public. • Easy materials to use by teachers and students. • Provide learners with the opportunity for independent study. • Save valuable time for teachers as they contain recommended activities, readings and review question. • Provide the necessary basic knowledge for a particular topic. • Provide a common experience for the whole class. • Ensure continuity of learning in case there is a change of teachers. • Last long if properly cared for. • Can be conveniently used at the learners’ pace. • Can be used by learners of all ages. • Review questions enable learners to do self-evaluation. Examine at least ten disadvantages of using print materials in T/L situations. • Who are my learners? (ie: age, level, interests). -Use captions and explanatory notes for diagrams and pictures. -Often a few large diagrams and pictures are better than many small ones. - Consider the visual literacy competencies of the readers. Are materials that communicate facts and ideas clearly and vividly through the combination of drawings, words and pictures. • are used to display summaries of data using histograms, pie charts, graphs, maps and other concept maps, diagrams. • Building charts’ materials: sugar paper, thin card, manila paper, cloth, or wrapping paper. • Big and clear print that can be seen by all the learners. • Labeling that is horizontal and in straight lines. • Accurate and if there are maps, drawn to scale. • Attractive enough to capture and hold attention and interest of the learners. • Accurate and authentic use of colors in its representation of people, events and things. (i.e: water masses should be blue and not any other color. • A neat layout with margins that makes important information stand out. • Suitable for the age and level of maturity of the learners. Discuss the position of charts in the current teaching and learning in Tanzanian schools. • tells a story or convey information attractively to people or learners. • Visually attractive in terms of color, design and letters used. • Must be large enough. • Assess why use of posters in teaching and learning in our classes are too minimal? • Do posters have advantages and disadvantages? Make your comments. • Can have different interpretations depending on past experiences of learners. Pinpoint four areas in your subject specialization in which pictures can be applied and briefly suggest good way on how could be applied? A chalkboard is a reusable writing surface on which the teacher writes and draws using chalk. • Colors of chalkboards (ie: black, blue, grey, green or any other color that provide good legibility). • Write the date, class, subject and topic at the start of the lesson. • Divide the blackboard into 2 or 3 more fields which are each similar in size. • Erase any written material on the chalkboard after each use. • Always keep the chalkboard clean. • Write horizontally and straight. • Keep the handwriting neat, legible and uniform. • Make sure that all the learners can see the chalkboard. • Use underlining, encircling or framing to focus attention on important details. • Avoid overcrowding the board to avoid confusion. • When the teacher needs to talk while writing, he/she should make sure he/she talks to the class and not to the chalkboard. • When pointing or explaining something, always stand at the side and use a pointer to avoid obstructing the learners’ view. • Organize work systematically on the chalkboard. • Develop the summary on the chalkboard as the lesson develops. • For recording the main points of a lesson. • For defining technical terms, keywords or concepts. • For developing sketch maps or drawings. • For writing a lesson summary. • For mounting charts and other T/L resources. • A board covered with cloth such as flannel/felt. • Cloth need to be plain to allow material displayed on it. • Information is prepared and then fixed using masking tape. • Take either a plywood or hardboard and cut it into required dimensions. • Cover one side of the board with flannel or felt, stretching it tightly as you pin it on the other side of the board with drawing pins. If flannel is not available, an old blanket tacked very tightly will do the trick. • Materials for use on the flannel board can be cut out from magazines or they could be drawn by you. By backing these materials with flannel, sandpaper, ink blotters, paint, felt pens, sponges or sacking, they will adhere readily to flannel or felt. • What seem to be the importance of flannel boards in T/L process? A bulletin board (pinboard, pin board, noticeboard, or notice board in British English) is a surface intended for the posting of public messages, for example, to advertise items wanted or for sale, announce events, or provide information. Bulletin boards are often made of a material such as cork to facilitate addition and removal of messages, or they can be placed on computer networks so people can leave and erase messages for other people to read and see. Resources means resource persons and non-resource persons. A person becomes a resource only if she/he is flexible to assist learners in learning difficulties. Comprise of aids, technologies and other media. -refers to a gathering place (ie: room, building etc) for learning purpose. - also a place where resources are kept. • Provision of facilities/guidance for production of materials. -to easy the retrieving system. TRC is a community of well trained people, adequately equipped with educational facilities located in attractive places to encourage and help students and teachers communicate, investigate and learn together as a team (Henderson, 1972). Is traced back in1950s-UK (Mushi, 2003) and in Britain-1960 (Khaisa, 2011). • Serves as teachers’ meeting places and also with their management. Reflecting of TRCs in Tanzania, assess their weaknesses. EDUCATIONAL MEDIA AND TECHNOLOGY:MODULE 1. EDUCATIONAL MEDIA AND TECHNOLOGY:MODULE 2. 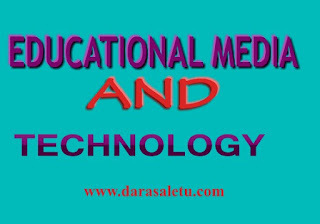 EDUCATIONAL MEDIA AND TECHNOLOGY:MODULE 3. EDUCATIONAL MEDIA AND TECHNOLOGY:MODULE 4.